I never hear as much hoopla about Imbolc as I do of the other pagan holidays, or at least most of them. This turn of the wheel seems to come and go without much recognition. At least on social media. I’m certain there are Witches all over the world honoring the halfway point between the dark and light halves of the year. But it’s pretty low key online. This is a great time to plan your garden. Our Ancestors blessed the seeds they intended to plant at this time. It was part of their planning. And certainly should be part of ours. Don’t you think? AND do remember to include your agricultural tools in this practice. They will be working hard to increase the fruits of your labor this season as well. Indoors? Pots and soil count! It’s a great time to order any supplies you may need for planting. After all, when you’re ready to head out there and ‘get to it’ you don’t want to be empty handed. Imbolc has many traditional foods. Milk and butter are among them for sure. But one of my all time favs are root veggies. These would have been some of the last edibles left in the home from the stores which had been put up for the long winter. And they are pretty damn tasty too! Make yourself a big pan of roasted root veggies to feast on with your dinner. Or brew up a delicious pot of root veggie stew. It would be all the better if you made a nice loaf of homemade bread to go with it! Serve it fresh out of the oven, and slathered in butter. Yummy! A main theme of the Imbolc celebration is divination. It is a time when we are leaving behind the dark half of the year and looking to the light half. Looking to the future, as you will. So grab your favorite divination tools and do exactly that. Look to see what the future has in store for you this coming season. If you have not worked with divination tools before, don’t fret! Today is a great time to start. Choose a tool that has been calling to you and begin to work on those skills. By next year you’ll have developed quite a handy little witchy power. Again, out with the old, in with the new! Imbolc provides us with a great opportunity to spring clean our homes. You can charge into this activity any way that suits you. Clean your whole house from top to bottom if you like. Many do. I personally like to focus on ‘problem areas’. You know, that drawer that you’ve been throwing everything you don’t know what to do with in. Or the closet that you can’t find your favorite pair of shoes in. I tackle a few problem areas and commit to dealing with EVERY item I find there. Every single one. If you’re able to open all of the doors and windows for a bit while you do this, GO FOR IT! Even in the very cold climate of northern Maine it is my intention to air out the house as part of my Imbolc celebration. I’ll be making it a point to intentionally usher out the old and welcome in the new. Room by room. Create a corn dolly to honor Brigid, just as our Ancestors did. There are endless resources for the construction of such a doll on the internet. She is simple and inexpensive to make. When you’ve completed making her place her by your hearth. If you do not have a hearth it is perfectly acceptable to use your stove as an alternative space. Or you can wrap her in white cloth and hang her over your front door. Put some of the focus on yourself by engaging in a ritual cleansing bath. Clean your bathroom and air it out by opening the windows for a bit. Even 5 minutes is great! Then light some candles and incense in the room and draw yourself a nice warm bath. Add floral oils to the water. Or if you prefer cleansing oils; such as sage, palo santo, cedar, or lemongrass. I also like to float flowers in my bath. Fresh flowers are not always readily available at this time. So I use dried herbs. Lavender, chamomile, calendula, and rose petals are my favorites. Relax in the water and declare your intention to use this time and space to purify and cleanse your mind, body, and soul. Call on Gaia to bless the process and listen for any message She may have for you concerning this season. This is a fabulous time for you to make your own candles. You can create a few just for the holiday season or make enough to use throughout the year. If you decide to make your own, definitely be sure that you make at least enough to burn one in each of your rooms for the holiday. Don’t miss out on burning a candle in each room of your home on Imbolc just because you didn’t make your own. Purchase a few candles. Infuse them with your intentions for the season. Place one in each room of your home, Be sure they are in a safe space. Light them on the evening of February 1st and allow them to burn until morning. Spend a few moments with your guardian and talk to it about the duties you want it to perform as the keeper of your entryway. Be clear in your desires. Speak your blessings over its work and place it in the space you’ve intended for it. If it is too cold to place it outside at this time, no worries! You can put it inside the entryway until the time arrives for it to take its rightful place outdoors. Walk the perimeter of your property carrying a torch, or a candle if that is better for you, and place purification and prosperity intentions as you go. Call for Gaia to bring vigorous growth to all plants and wildlife present in this space. And to pour abundant prosperity on everything within the boundaries of this space. Particularly, you and your family. Head out to a local water source; a lake, river, stream, etc … If you are able to strip and head in the water skyclad that is awesome. Here in Maine I will not be embarking on the venture. Brrrrrrr! 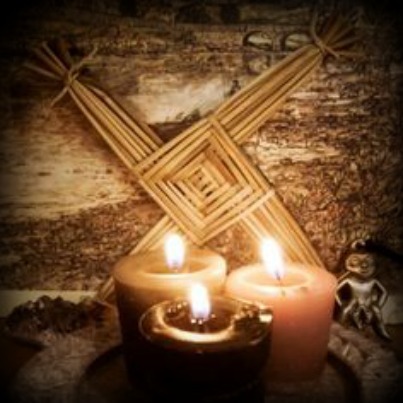 Making a cross from straw is an age-old tradition connected to Imbolc. These crosses were made and exchanged as a symbol of health, protection, and prosperity. It was tradition to hang them on the kitchen wall. You will easily find instructions for making one on the web. Make them with the kids and allow them to hang theirs over their beds. They love this activity 😉 It’s a great way to involve them!